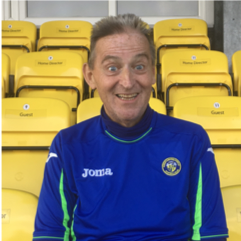 On the afternoon of 28thApril the Many Shades of Grey are hosting a charity Walking Football Festival for the 60+ age group in memory of Rich Bonsey, one of our walking footballers who died of cancer in April 2017. We have eight teams taking part, from South Bucks and Chiltern, from Bognor Regis Boulders, from Emsworth & Hayling, from Fleet of Foot, and from the Many Shades themselves. You’ll have worked out by now that that’s only five teams. The Festival is being held to raise funds for the British Heart Foundation, for Cancer Research UK, and for Versus Arthritis. Those other three teams are “All Star” teams made up of players who have had either a heart attack or stroke, or some form of cancer diagnosis, or one or more hip or knee joint replacements. We would love it if people would turn up to cheer the players on ahead of our 1.00pm kick-off at Park Community School, Middle Park Way, Leigh Park, PO9 4BU, Sunday 28thApril 2019. We will be collecting for these three great charities, so bring lots of cash with you! Admission is free, and matchday programmes will be available at £2.00. The Festival is scheduled to end at 4.00pm. We hope that this Festival will not only raise lots of money for the charities, but will also serve as some sort of inspiration for people who have experienced one or other of these potentially life-changing conditions. At the point of diagnosis for any of these conditions the sense of despair and helplessness can be very debilitating. We recognise that not everyone who experiences these illnesses will be able to live an active life post-diagnosis, but hope that the example of these players will give encouragement to many who would otherwise have felt that an active life is no longer an option. We thank our Festival Corporate Sponsors, Morgan Innovation and Technology, and Snows (Motability) for their generous support.